It averages about 75 degrees year-round and, up here at 4,500 feet, it gets cool enough for a light sweatshirt after dark. 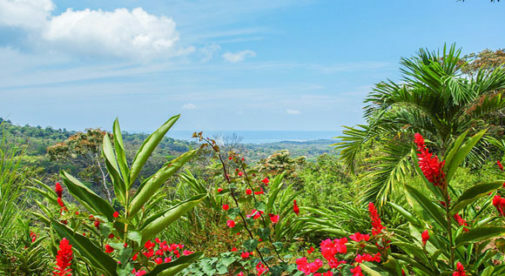 In the beach areas of Costa Rica, it’s definitely warmer and more humid—tempered by the sea breezes. But I can guarantee you that it never gets cold. And that means a life spent outdoors in the fresh air and enjoying the natural beauty that is all around you in Costa Rica—no matter where you go. But the tropical climate is just one of the things that attracted my family (not to mention thousands of our fellow expats) to Costa Rica. Another big factor is the lower cost of living. Sure, things like cars and electronics can be pricey. But we still spend a lot less money every month. And there are two things at play there. First, our expenses are much lower. For example, we shop mainly at the farmers’ market, known as the feria, and haul back a week’s worth of fruits, veggies, bread, seafood, cheese, and more for about $50 (that’s for a family of four). And our rental home, a five-bedroom on nearly an acre of land with an awesome view of the valley below, costs a half or less of what it would in the U.S. (You can find similar deals if you buy.) It costs us $1,100 a month—but for that we’re getting a very luxurious place. If you want to live more affordably you can. I have friends who rent simpler two-bedroom places, in great locations, for just $300-$400 a month. An added bonus: we haven’t had to clean our house or mow the lawn in two years—with labor at $4 an hour (and we overpay), we much prefer to have somebody else do the chores. Second, we find that we’ve lost that desire that we had back home to buy things we don’t really need. No more new wardrobes each year. No more pining for the latest smartphone. The old car we have that runs just fine will do. Like a lot of expats, we’ve taken a step back from consumer craziness. It’s something that just happens when you live in Costa Rica. There’s a saying here: Pura Vida. Translated literally it means “pure life.” But really it’s deeper than that. You work to live, not live to work. And time spent with family and friends is always the priority. It’s an attitude that Ticos (what Costa Ricans call themselves) have that rubs off on expats pretty quickly. There’s much more that makes this country so attractive. The medical care is cheap and top-quality. People are very friendly to new “gringo” neighbors. There’s a tremendous variety of landscapes, from rain forest to white-sand beaches to quiet mountain villages to bustling market towns. And finally, because foreigners have been coming here for more than 30 years to live and retire…things are pretty set up for expats as far as communities, social activities, clubs, and more go. No need to be a pioneer, in other words. And you’ll find it easy to fit in and make friends. I guess you could say that at a basic level expats in Costa Rica want to live better than they could back home. And when you consider everything this country has going for it…most find that they can.